When dozens of the world’s industry leaders look towards one country—and specifically one region in a country—to establish manufacturing facilities, there’s a good reason. Medical device manufacturers have been setting up operations in Mexico for decades. In particular, Baja California and Tijuana have attracted major players like Medtronic, Hill-Rom, DJO Global and Greatbatch Medical. Why Mexico, and why should other medical device manufacturers consider moving or expanding their operations there? Whether you’re an OEM, Tier 1, Tier 2, or Tier 3 supplier, having a presence in Mexico gives you greater access to the medical device supply chain—or even an opportunity to fill a gap in that chain. Baja California (Tijuana in particular), has become one of the most significant medical device clusters worldwide—the Baja California Medical Device Cluster represents 63 plants employing 60,000 workers. 70% of the plants in Tijuana are American-owned. 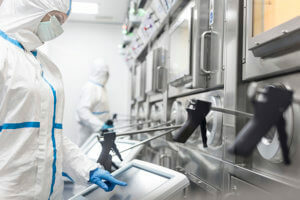 The workers at these plants are skilled engineers and technicians making everything from parts for pacemakers to surgical equipment to catheters. Tijuana has benefited from its proximity to San Diego and its high concentration of biomedical companies and research institutions. For example, Thermo Fisher, headquartered in north San Diego County, selected Tijuana for both a manufacturing plant and IT Center of Excellence due in part to Tijuana’s accessibility from San Diego. Labor costs in Mexico are far lower than in the United States, but the skill level and quality of work is equal. Companies move to Mexico once they see that they won’t have to make any sacrifices in their production quality. Mexico is the leading supplier of medical devices to the US and eighth-largest supplier in the world—according to ProMexico, Mexico exported just over $9 billion in medical devices in 2016. Defibrillators, catheters, and syringes made in Mexico are found in hospitals throughout the US. In Tijuana, you’ll find Class I, II, and III products being manufactured in ISO-certified plants with Class 100 to 100,000 clean rooms. Throughout Mexico, universities and trade schools have focused on engineering programs to better serve the medical device, aerospace, and electronics industries. We’ve already mentioned that Tijuana’s location makes it ideal for many medical device manufacturers. In an industry where shipping and transportation speed is critical, Mexico can’t be outdone. From Tijuana, a shipment can make it to Los Angeles in just a few hours by truck. Shipments can reach the East Coast in five hours by air and five days by truck. Unlike other countries in Latin America, Mexico already has the infrastructure to handle speedy shipments. It’s also easy to visit plants in Mexico—a company headquartered in San Diego with a facility in Mexico can make the trip there and back in a day. Even for a company on the East Coast, it’s a relatively quick cross-country flight with a time difference of no more than four hours. Learn more about the benefits of medical device manufacturing in Mexico. Contact us today.